For the ENGLISH text, see below. Después de sobrevivir múltiples aventuras, la versión española de Bécquer eterno ya está a la venta como un e-book. Por ahora solamente en Amazon (Amazon.com, http://www.amazon.com/B%C3%A9cquer-eterno-Spanish-Edition-ebook/dp/B0088JOJLG, y Amazon.es, http://goo.gl/kJlSE, entre otras) pero pronto lo estará en Barnes and Noble y Smashwords. Así lo podréis leer independientemente del tipo de lector que tengáis, o en vuestro ordenador si no tenéis lector digital. Y si vivís en Sevilla y visitáis la Exposición Bécquer tan cerca… a través del arte, no os olvidéis de visitar el patio dónde encontrareis entre otros libros y poemas dedicados a su memoria, una copia de mi sencillo homenaje al genial poeta. After many adventures, the Spanish version of Bécquer eterno is available as an e-book. So far you can purchase it at Amazon (Amazon.com, http://www.amazon.com/B%C3%A9cquer-eterno-Spanish-Edition-ebook/dp/B0088JOJLG, and Amazon.es, http://goo.gl/kJlSE, among others) and soon too at Barnes and Noble and Smashwords. And if you live or plan to visit Sevilla before June 25, don’t forget to visit the exhibit, Bécquer tan cerca… a través del arte. 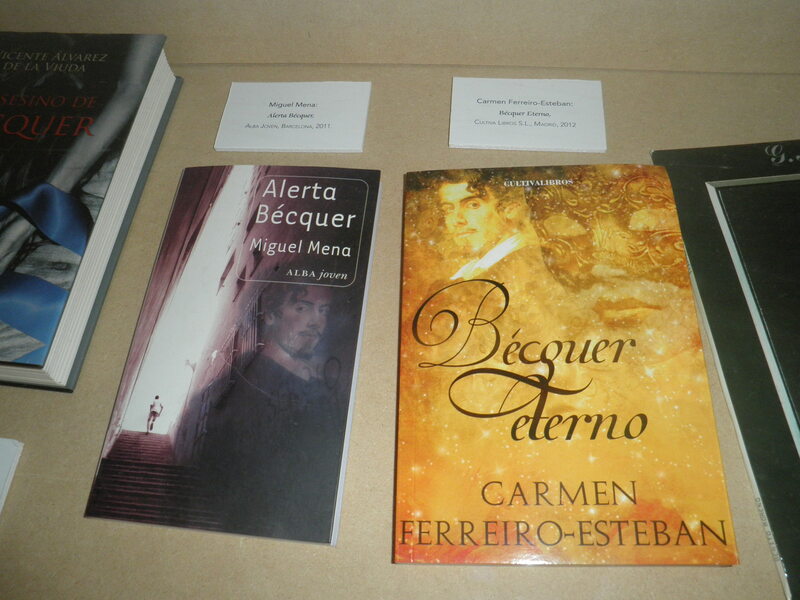 There in the beautiful patio of the Fundación Valentín de Madariaga you can see a printed copy of Bécquer eterno, among other books and poems that remember the unforgettable genius of this most beloved poet. Buenas noticias: mi novela paranormal Bécquer Eterno será publicada a finales de año a través de la editorial norteamericana Crimson Romance. La portada de la edición en inglés será distinta de la versión en español, pero ambas evocan el espíritu romántico de la historia. La edición española estará a la venta a través de Cultiva libros (http://www.cultivalibros.com/) la semana entrante y en edición digital en Amazon.es and Amazon.com en las próximas semanas. Y si os animais a leerla y escribir una reseña por favor uniros a la lectura conjunta que LAKY en “Libros que hay que leer” ha organizado (http://goo.gl/cnJZ2). 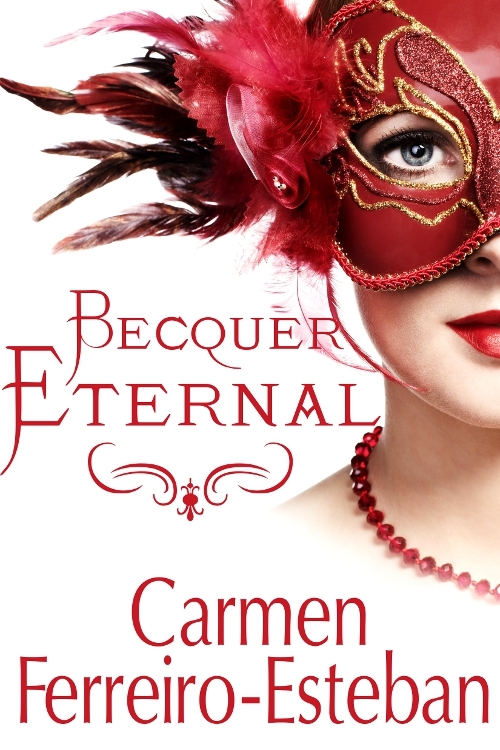 I’m thrilled to announce that my paranormal story Bécquer Eternal will be published by Crimson Romance at the end of 2012. They had agreed to keep the gorgeous cover Elaina Lee created for me back when I was signed with Astraea Press. 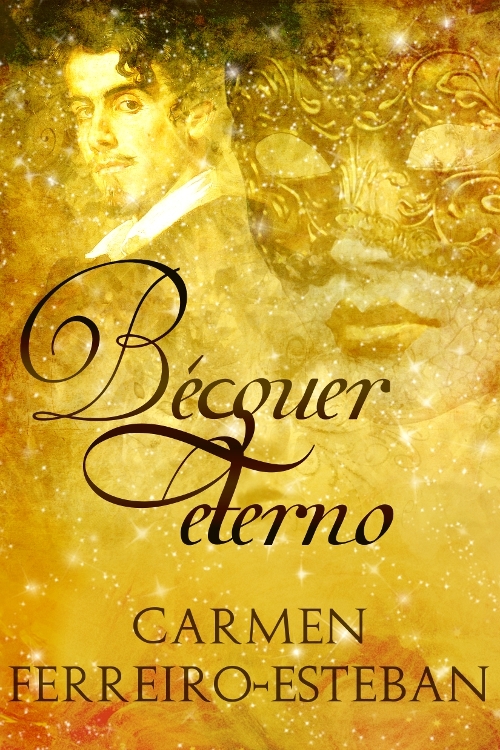 If you speak Spanish, you are in luck because the Spanish version, Bécquer Eterno, will be available next week through Culitiva Libros and Amazon.com. And if you have your own blog, you can join the Blog Tour that LAKY at “Libros que hay que leer” has organized for me (http://goo.gl/cnJZ2). Thank you so much, LAKY! I haven’t blogged lately because I have been way too busy with the translation of my paranormal story Bécquer Eternal into Spanish. 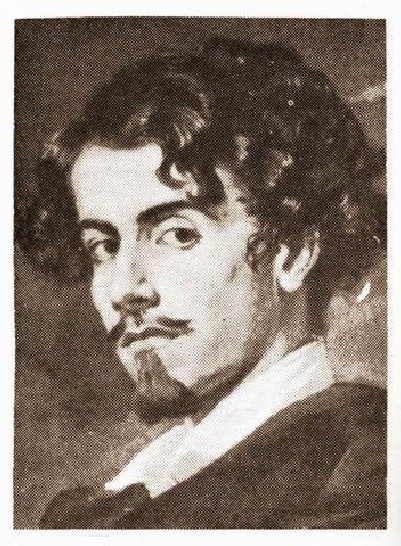 This year marks the 176 anniversary of Bécquer’s birthday and his home town of Sevilla (Spain) is having an Exhibit in his honor. Many artists (poets, musicians, painters, sculptures, silversmiths, etc.) will remember him with their work. And I’m happy to say a copy of my book in Spanish will be included in the exhibit. As the Exhibit will take place between May 25 and June 24, I must finish my translation, like yesterday, so I can get a printed copy in time. I have worked as a translator for over ten years and Spanish is my native language. So I was surprised to realize how difficult it was to translate my own work. Yes, I knew this to be the case when you’re working with a literary text. But I knew it in a cerebral way. I knew it in my mind, not in my guts. I will show you examples in future blogs. Right now, Ill explain what I mean with an image, two images to be precise, that happen to be the covers of the English and Spanish version of my book. Although they’re quite different, both transmit the spirit of my story. The Spanish cover includes a portrait of Bécquer on the left. This portrait is as iconic in Spain as a picture of a blonde Marylyn would be in the States. But the cultural reference would be lost in an American audience. And so it’s with the literary images. Cultural references are lost and must be substituted with others, making the translation both a frustrating and an exhilarating experience. I’ll tell you more about it next week. Now, it’s back to work for me. 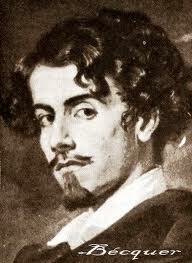 If Bécquer were alive today, as he is in my story, he’d be 176 years old. To celebrate this, his native town of Sevilla (Spain) has organized an Exhibit about the beloved author who, through his felt poems of unrequited love, provided many generations of Spanish teens a voice to mirror their experiences. In this exhibit called “BÉCQUER, TAN CERCA… A TRAVÉS DEL ARTE” (“Becquer, so close…through art”), a hundred artists—painters, musicians, goldsmiths, sculptors, poets and writers—will share their work done in remembrance of the great Spanish author. I’m thrilled to announce that an Spanish edition of my paranormal novel Bécquer Eternal (Bécquer eterno) will be part of the exhibit. There is more big news. My publisher Astraea Press has sent me already the final covers for the book. 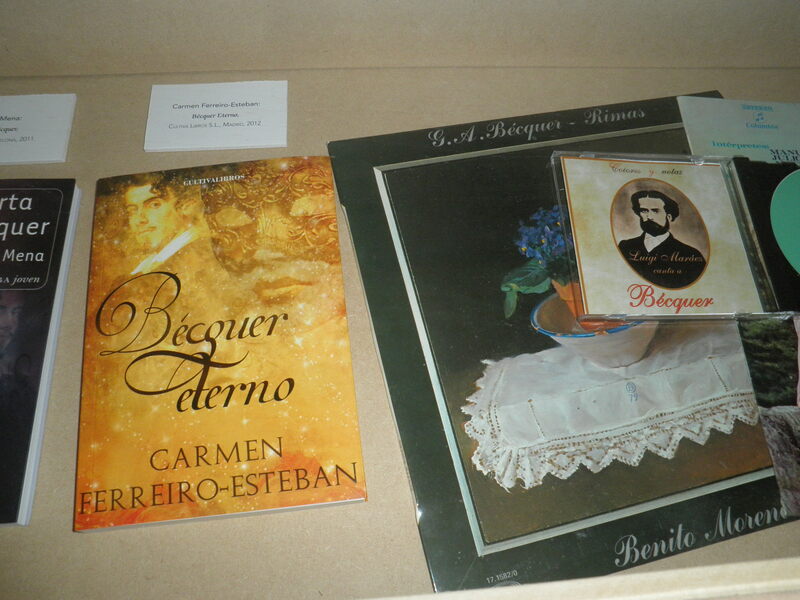 And because I wanted to include the picture of the real Bécquer in the Spanish edition, Astraea has graciously agreed to provide two different covers.